If you’re not thinking pink by now, you must live under a rock. October is breast cancer awareness month and every news media outlet is saturated with information on breast cancer, whether it’s detection, prevention, or a race for the cure. But I’m not complaining. As a mammographer and breast cancer survivor, I welcome the media blitz. Women need to know that breast cancer does not discriminate. Women of all races can develop breast cancer. 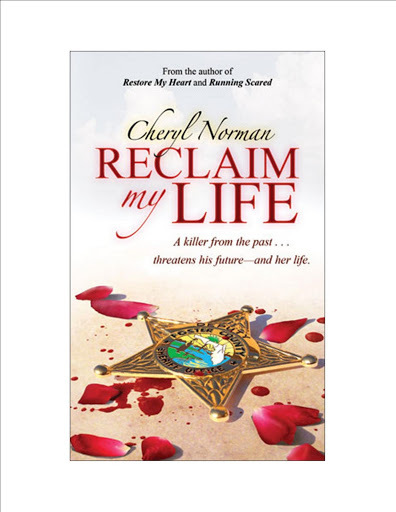 My guest today is romantic suspense author and breast cancer survivor, Cheryl Norman. Welcome Cheryl. Before we start talking breast cancer, mammography, and Breast Self Exams, why not tell us something about your latest release, Reclaim my Life. Maybe a brief blurb and excerpt? With pleasure! I wrote Reclaim My Life during the Bugaboo wildfire, a terrible fire that destroyed 120,000+ acres in north Florida and merged with two other fires in Georgia. It was a time of drought, fires, and then a tropical storm. So all those natural disasters form the setting for the book. The romantic suspense involves a small-town sheriff and his serial killer investigation. He worries that English professor Elizabeth Stevens will be the next victim until he learns who she really is. In hiding as part of the Witness Security Program, she may be responsible for bringing a killer to his town. Unfortunately, he’s fallen in love with her. Keeping her alive means letting her go into hiding under another identity . . . if he can keep her alive until the marshal arrives. Either way, he loses and may never see her again. I love romantic suspense and this sounds like a great story. Where can readers find your books? Or ask your favorite bookseller to order it. I know you have a busy schedule and I really appreciate you taking the time to tell your story. I understand you’re a big proponent of Breast Self Exams. I am too, especially for women 35-49 who have dense breast tissue which often obscures hidden cancers that may first show up as microcalcifications on mammograms. Of course, digital mammography increases the benefits of screening mammography in women 35-49, but The U.S. Preventive Services Task Force (USPSTF) wants to change screening guidelines, (which are based on film screen technology-not the newer digital mammograms) and they want to encourage women to stop doing self breast exams. These “experts” don’t believe the average woman has the knowledge to detect changes in her own breast. What’s your take on this subject? That task force is sadly ignorant. Mammography is an important tool in detecting abnormalities that can then be studied further using a sonagram. An annual checkup that includes a breast examination by a doctor is another tool. But patients must take responsibility for their own health, and that includes monthly breast self-exams. Know your body so you’ll be aware of any change. My testimony is a perfect example of how the three tools work as checks and balances. In January, I had a digital mammogram. The results were clean. In February (only two weeks after the mammogram), I had a good checkup with my primary physician. In March, while performing my regular BSE, I discovered a lump in my left breast. By mid-April, when it was removed, the lump had grown to 2cm. in size, although the sentinel lymph node was clean. I shudder to think what my diagnosis would have been had I waited until the next January for my next mammogram. I’ve become the poster child of BSEs! Because I caught my breast cancer early, I have an excellent chance of survival. Early detection is crucial. Although the cure rate has improved greatly in the past two decades, breast cancer is not beaten. It kills someone in the world every 69 seconds. That’s a sobering statistic. Sobering indeed! It is the number two killer of women. The American Cancer Society, The FDA, and the American College of Radiology recommend women get their baseline screening mammogram at age 35 and annual screening mammograms beginning at age 40 or sooner if they have a first degree relative diagnosed with breast cancer before age 50. However, the USPSTF thinks all women without a family history of breast cancer should not start routine screening until age 50 and then only every other year. The report does not recommend routine screening mammography in women age 40 to 49 unless they have a strong family history or find a lump through self breast or clinical breast exams. But they discourage BSE’s and fail to mention that a lump indicates active disease and a stronger possibility that the cancer has spread. I was 47 when diagnosed. I had no lump on either CBE (clinical breast exam) or BSE (breast self exam) and I had no family history. Still, I had Ductal Carcinoma Insitu and an invasive carcinoma that showed up on a routine screening mammogram. I was lucky. My cancer was stage one. It had not spread to any of my lymph nodes because it was detected early. Can you tell us more about your cancer, how it was detected, and the treatments you’re now undergoing? First, let me say that the age thing is a joke. My oncologist said the younger a woman is when she’s diagnosed, the worse her chances of survival. So how does waiting until she’s older to do routine exams and mammograms make sense? It doesn’t. The survival rate for breast cancer is inversely proportionate to age at diagnosis, even with early detection. I’m 61 (no need to be coy; it’s pasted on my MySpace and Facebook for all the world to see *LOL*), which is the median age for women to be diagnosed with breast cancer. Although I was stage one, I was borderline. The pathology revealed rapid mitosis rate (fast-growing) cancer cells that were hormone-receptive. In other words, aggressive. Treatment was aggressive, too, and included radiation, chemotherapy, and drug therapy. I completed chemo this summer and am beginning radiation this month. Because I was HER2 positive, I need to take a drug called Herceptin for a year. It is administered via IV just likechemo medications. I’ll finish Herceptin in May. Then I have to take a pill for 5 years. I have to have a MUGA scan on my heart every three months to monitor for heart damage as that is a potential side effect of Herceptin (so far I’ve passed). I also have mammograms every six months. I’m scheduled for a bone density test this month (possible bone loss from the chemo drugs), and after radiation I have to have a screening colonoscopy. I guess once you have cancer, you’re considered at risk for all cancers. And once you are diagnosed, you do what you need to do to heal. I want to emphasize to all women the importance of prompt treatment. Don’t dread the process, and don’t delay. My promptness brought me a much easier chemo experience than some. I never got sick, never lost weight (darn it!) yet did lose my hair, and had mostly mild side-effects. Fatigue was the worst of it. The more progressed your cancer, the stronger the drug recipe. But even if you’re diagnosed stage four, all is not lost. I’ve met survivors who beat it, then beat it a second time. That’s how much progress has been made in treating breast cancer. The bottom line is to keep on top of your health status. Know your body, get regular exams and mammograms, and seek immediate help if something seems abnormal. Don’t delay and don’t be afraid. Finally, contact the American Cancer Society if you need help, either with medical expenses or emotional support. They are a good resource for all cancer patients. Thanks to Lilly Gayle and Cheryl Norman for a most informative and inspiring interview on breast cancer.Out of the Darkness by Lilly Gayle is a great read and Reclaim my Life by Cheryl Norman sounds very good. Will order it today. Thanks Lilly for the recommendation. Cheryl, congratulations on surviving breast cancer. You new book sounds intriguing. Best of luck with sales. So sorry for your loss, LaVerne. And Kudos to the New Zealand government for taking women's issues seriously. I'm hoping to finish my book soon, Becky. As soon as I get these revisions done on a requested historical, I'm going to get back to it ASAP! Thanks for stopping by.